County Councillor Liz Oades is delighted that more highways works are programmed to be carried out this year, in her Fylde East division. With excellent co-operation from Weshams’ Fylde Borough Councillor, Cllr Mrs Linda Nulty, and Wesham Town Council, many areas have been identified that will be included in the programme. Councillor Oades, since being elected over 2 years ago, has worked with the highway department to get a rolling programme of works carried out in her Ward and is pleased that more road/footway treatments are added each year, she believes that regular maintenance is essential to ensure that roads and pavements are kept in a good state of repair and hopes that future budgets for highways will be increased and not cut. Wesham will have slurry treatment to footways, re-kerbing, with some additional dropped pedestrian crossings, where work allows, to Garstang Road South and Segar Street, Railway Terrace, Charnock Street, Thompson Street, Rawlinson Street, Porter Street East, Billington Street East, Garstang Road South, Garstang Road North/Station Road. The Treales village centre along Kirkham Road, Treales, is to be resurfaced. Newton with Clifton will get more dropped kerbs installed on Oak Lane, Meadow Close and Bryning Lane/ School Lane, and the carriageway on Preston Old Road and Meadow Close are to be resurfaced/patched. There are plans to undertake surface slurry sealing treatment to footways in Kirkham in Ward Street, Fylde Street, Ribby Road, Moor Street, Swarbrick Street and Orders Lane, and Poulton Street/other streets will be assessed for possible future footway works. The next PACT meeting is on Wednesday 6th February from 3.30pm until 4.30pm The Community bus will be parked on Billington Street Wesham for a street surgery. In a previous posting of extracts of the minutes from the last (January) Wesham Town Council meeting it was reported that concern has been expressed by Councillors attending the recent Fylde Parish Liaison meeting for the posssible financial rearrangements for the funding of Kirkham Swimming Baths. It now appears that it is much worse, with threats of closure of the baths and also other Fylde facilities including St Annes Swimming Baths, Lowther Pavilion and Fairhaven Lake. An interesting article has been published at: http://www.blackpoolgazette.co.uk/blackpoolnews/Major-Fylde-attractions-earmarked-for.3714285.jp?CommentPage=1&CommentPageLength=10#comments including concerns and comments expressed by many. Have your say by visiting the Gazette site and leaving your views. The Parish Plan Steering Committee met on January 23rd to put the final detail to the questionnaire which will be circulated to every household in Medlar with Wesham after the printing and delivery arrangements have been made. The Chairman, Trevor Jago, introduced a busy agenda which was enthusiastically dealt with by the committee. The Secretary, John Westmoreland, led the debate on the revised constitution ,which was adopted, and also the separate Business Questionnaire that will run in parallel with the main questionnaire.. The main part of the meeting dealt with the final wording of the questionnaire and the methodology for the delivery, collection and analysis of the completed questionnaires. To encourage completion, monetary prizes will be given to the 1st, 2nd and 3rd entries drawn in a raffle. The committee is made up of Wesham Town Councillors; The Mayor, Cllr Dave Ogden; Cllr Mrs Linda Nulty and Cllr Alan Clayton, along with the Chairman, The Secretary and members of the public. A special thanks goes to Nigel Bradley who has compiled the draft questionnaire based on the results of previous meetings. For further information contact the Secretary, John Westmoreland 01772 685415. PC Gary Cross reported that the monthly Police and Community Together (PACT) meetings were to be relocated for a trial period with a mobile community bus. The next one being on February 6th at a location to be announced. 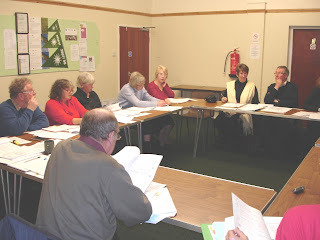 The Mayor raised his concern to a Councillor on the matter of attendance and apologies not being given for, Wesham Town Council Meetings; Community Centre Meetings and important functions and events such as Civic Sunday, Remembrance Sunday, conducted by Wesham Council that were of importance for the Town and the People of Medlar with Wesham. Cllr Geoff Dixon reported that the changing rooms had been painted and consideration was given to future use for the Youth. There would be a requirement for remedial work to be completed. Cllr Linda Nulty agreed to contact the Youth Community Service to discuss the likelyhood of the Youth Workers agreeing that this was a suitable location and building, to become a 'Youth Centre' after agreed possible modification to the existing layout. Before final arrangements are made for the proposed Skate Park, The Mayor, Cllr David Ogden wanted to be provided with the results of the Consultation Exercise carried out in December. Cllr Linda Nulty was concerned to ensure that the Youth's opinions of the type of equipment were also considered and made known before the project goes ahead. Cllr Nulty has now contacted the Youth Service. As previously reported, Cllr Alan Clayton has now been authorised to place the order for the unit. The Council considered 3 estimates for the new Council notice Board to replace the old one located at the Old Fire Station. The order has now been placed for a hard wood unit to be constructed and installed soon by a local tradesman. Cllr Alan Clayton reported that the next meeting of the Committee would be on Wednesday 23rd January. Following this meeting it is anticipated that questionnaires will be distributed to every household. At a recent Town and Parish Liaison meeting Kirkham Town Council raised attention to the fact that Kirkham Town Council and St Annes Parish Council had been asked for financial contribution towards continued running of the Kirkham pool and the St Annes pool. It was felt that these baths provided a facility for most other parts of the Borough and it was agreed by all other Fylde Parishes (at the Parish Liaison Meeting) that it was unfair to burden Kirkham in this instance, and St Annes in their case, with this sole responsibility and that either all Parishes be asked for a contribution or more importantly that this should remain a whole Fylde Borough Councils' responsibility. The majority of Wesham Town Councillors agreed with this view. The above represents a summary of the items discussed. The full minutes will be available in due course. 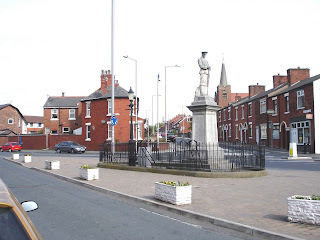 If you wish to make any comments on any of the posts within this site, or indeed any activities in Wesham, please feel free to use the 'Contact Form' at the bottom of the page. The annual Party was held on Tuesday 15th January 2008. There was a total of 60 senior citizens who attended the evening along with The Mayor and Mayoress of Medlar with Wesham, Cllr David and Mrs Evelyn Ogden and Rev Paul Bennett. and lollies from the committee as a 'thank you'. 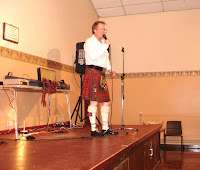 The entertainment continued from two very talented artists, Jane Harvey and Barry Mcqueen. The guests showed their appreciation for the entire evening which was enjoyed by all. 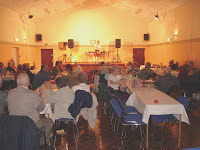 During the evening many raffle prizes were distributed, some of which were part of the 'free' raffle ticket provided by the committee. The evening concluded with a combination of disco and traditional dance music. 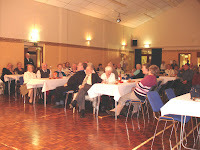 All in all, everyone appeared to have had an enjoyable and entertaining evening, due to be repeated in January 2009! By popular request we are hoping that we are able to enlist the services of the same artists for next year. Our sincere thanks goes to our Chairman Cllr Mrs Linda Nulty for organising the party yet again, buying and cooking the food, and the helpers who prepared the meal and set up the Community Centre. If you are over 60 and a resident of Wesham, be sure to join us next year...put a note in your diary for Tuesday 20th January 2009! 1300 hits since start up on 13th December 2007. See the live counter at the bottom of page for up to date figures. I now have statistical data which supports the effectiveness of such a device from LCC. 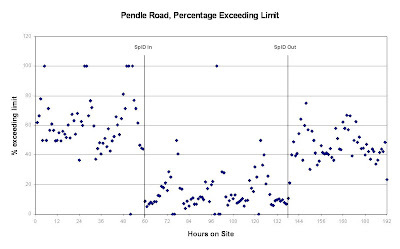 The graph shown above indicates a site in Lancashire where a SPID was put into use over a 192 hour period. The percentage of roadusers exceeding the speed limit before the SPID was deployed can be seen to the left of the graph and similarly those exceeding the speed limit after the SPID was removed can be seen at the right of the graph. The centre of the graph clearly show a significant reduction in those exceeding the limit during deployment of the SPID. 1. THERE IS AN IMMEDIATE AND NOTICEABLE EFFECT ON DRIVERS WHEN THE SPEED INDICATOR EQUIPMENT BECOMES OPERATIONAL. 2. THIS EFFECT IS MOST NOTICEABLE ON THE PERCENTAGE OF DRIVERS EXCEEDING THE SPEED LIMIT. 3. THERE IS A SLIGHT RESIDUAL EFFECT AFTER THE EQUIPMENT IS REMOVED. Following concerns and complaints about the safety of the new roundabout on Station Road, fearing that the current layout of the traffic measure could cause a serious accident, Wesham residents and local councillors are pleased that county bosses have decided to re-think their designs for the road layout.